From the amount of water currently falling from the sky, the drop in temperature, and the vast profusion of brambles covering every bit of roadside and waste ground, I think it’s fair to say that autumn has arrived. Last night I made a celery gratin, straight out of Marcella Hazan, braising the stalks in chicken stock and bacon, then grilling them under a blanket of parmesan; warm and savoury but stopping short of outright rib-sticking, it was a good way to usher in the most British of seasons – the one where you can really get down to the business of cooking, after all the saladeering and cold-cut-arranging of summer. Nuts, mushrooms, stone and orchard fruits, the first of our local shellfish; so much that is good comes from autumn. It also, of course, marks the start of the game season. There is a tendency among chefs to lump in all game as equally good (ethically, environmentally speaking) wild meat, free of the endless problems of welfare and sustainability that surround the farming of domestic food animals; certainly, you can see why. A wild bird is shot in its natural landscape, never having seen the inside of a barn of abattoir; what is killed is sold and eaten. The management of grouse moorland, meanwhile, is claimed to be an outright ‘good thing’ for the local wildlife, although it should be said that this claim is largely made by hunters and gamekeepers. Conservationists, pointing to the killing and persecution of legally protected raptors which seems an inevitable consequence of, particularly, driven grouse shooting, tend to differ. It is, perhaps, unfortunate that the people making such great strides in terms of ethically produced domestic meat should think so little of wider issues, especially since those issues – of habitat and ecosystem – are familiar from debates on fishing; so it goes. Since the whole thing seems designed, not for any gastronomic benefit, but for the sport of a gilet-clad, blunderbuss-toting aristocracy, of which the meat is almost a by-product, I find the whole thing rather distasteful; perhaps we should leave them their sport, lest they take their guns to the urban poor. Perhaps, though, it should be banned outright, and those who kill protected species fully prosecuted. I don’t know. Best to steer clear of the issue, sticking to the rough shoots, the meat of pests and vermin which can be enjoyed with a fairly clear conscience – that is to say, of rabbits and of pigeons. I’ve written about rabbit twice before, and it remains one of my favourite meats; pigeon, though generally available pretty cheaply year-round, has a much more gamey character, a rich redness which makes it worth saving for the game season proper. I suppose you could stick one on the barbecue, but for me it isn’t really a summer meat, its affinity with peas notwithstanding. Pigeon does very well, however, with any of the produce of early autumn, with a little mushroom sauce or cobnut salad, or, as here, with blackberries. It is a truism that meat goes well with things that it like to eat; rabbit with carrots and radishes, venison with mountain herbs, pork with pretty much anything – although as pigs apparently dislike plants of the oregano family, I try never to include them in recipes. Presumably grouse live on bread sauce and sherry. With pigeon, though, there seems a little truth in it, insofar as the aforementioned pea plants they love to rob, and in the fruit of the bramble, which goes as well on a plate with them as in their stomachs – though it should be noted that blackberries, especially when lightly pickled, go pretty well with all game, their inky sharpness cutting through the animal rankness of wild meat. This is an extremely simple recipe, for which I make no apologies – the first meals of any season should always be simple. I’ve said it before, but it’s worth saying again – if you buy blackberries, you’re an idiot. Unless you live in a dystopian city block or a desert, go and find some. First get your pigeon out of the fridge and out of whatever packaging. Pat it dry and maybe give the skin side a preliminary salting. If the birds are whole, pull out the hearts and set aside for a snack. Put the blackberries in a bowl – it’s hard to cook with them in your hands. In a small pan, bring the vinegar to the boil with the salt and sugar, making sure they’re dissolved, then add a little gin and pour over the berries. Leave to cool. If you’re using breasts, cooking them is really simple. Find a pan big enough to hold four breasts without touching, and get it really hot. Add a splash of oil and then the pigeon, skin side first, pressing down a little to prevent curling. Sear for two minutes each side, then remove to a plate to rest. Whole pigeons are only slightly more involved. Heat the oven high and get an ovenproof frying pan really hot. Oil, then sear the birds on each breast until nicely brown, then sit on their backs, stick a knob of butter inside them, and put in the oven; eight minutes should do it. The butter should have melted. Put on a plate to rest, breast-side down so the juices flow through it. Done! Carve the meat (breasts horizontally sliced, birds cut through the middle with a cleaver and opened out) and serve with a spoon of pickled blackberries on the side. Perfectly delicious. Where does yeast come from, asks Elizabeth David in her quietly impressive work on bread and yeasted baking, out of the everything? Yes, is the simple answer. Wild yeasts float and permeate and surround us, settling and breeding where they find food, moisture and the conditions of their tiny lives; the act of collecting, taming and cultivating them to serve the specific purposes of man has been the work of millennia. In Middle English yeast was known as goddisgoode, God-Is-Good, because of the mysterious ways in which it works its benefits to mankind; until quite recently, we hadn’t got much further in understanding it. Now, of course, every kitchen and artisan bakery has their own culture of wild yeasts, among other entities, in the form of a sourdough starter or mother; more precisely, this is known as a SCOBY, a symbiotic culture of bacteria and yeast, to include the lactobacillus whose fermentation provides the sour part of the equation. The balance between these two factors, maintained and controlled by careful feeding, regulation of temperature, and culling of the livelier elements, is what gives each sourdough starter, also called a ferment or leaven, its particular character. It is undeniable that sourdough yeast provides a crust and flavour quite unlike, and in many ways far superior to, that created by commercial yeast, and the rhetoric (there is always a lot of rhetoric) around sourdough bakeries is that of proper, traditional, real, old-fashioned and true baking – the implication being that immediately prior to the invention of sliced bread in 1928, every village and street-corner bakery, every farmhouse and country home, had their own carefully nurtured sourdough culture; naturally, the facts are more complicated. Time and again the emphasis in David’s narrative is on the avoidance of sourness and excessive fermentation; rather than keeping their bacteria alive, the protagonists, from ancient Egypt to modern Britain, discard excess starter, keeping perhaps a little dough aside for the next batch. Sometimes, though, they start afresh each time. The story of bread-making, in tandem with the rest of human progress, is thus not that of preserving wildness but of the steady elimination of the wildest aspects of it to leave only what is useful. Strange, half-live leaven was Biblically associated with corruption, both bodily and moral (see, for example, I Corinthians 5), and therefore looked on with, at best, suspicion, particularly in Protestant countries; that weird yeasty funk was filled with sourness, rot, taint, the creeping horror of the natural – was filled with the devil. I AM LEGION – WE ARE MANY could be the haunting scream of a teeming sourdough culture, invisible yeast and bacillus working as one. The good bakers of old England took no chances, and got their yeast from the breweries, while those households which continued to use home-made yeast did so despite rather than because of its sourness, which was kept in check but accepted as a fair price for the superior depth of flavour and texture achieved. Even this limited and somewhat hidden tradition had died out by the time David came to write her history; she describes home-made barms (only very occasionally does she use the now-ubiquitous term sourdough, and then to describe an inferior, rustic bread) as one of those lost tastes, alongside perhaps sylphium and dodo, flavours lost to the march of progress. In her businesslike fashion, she wastes no time mourning this apparent total break in the thread of tradition – admirable, perhaps, but she does consequently miss the fact that the tradition was alive and well elsewhere. Our artisan bread bakers of today take their cues not from the narrow field of the English farmhouse kitchen, but from the cuisines of Poland, Germany, of France and Italy and particularly America, which has refracted all of these into its own traditions. Things survive in immigrant cultures long after progress or turmoil have destroyed them at home, kept alive if only by force of nostalgia, and sourdough (I assume the word came to us from America) soon found its own niche, with an amenable ecosystem (the most common lactobacillus is named after its home city of San Francisco) and suitable attendant mythology. The Alaskan gold prospectors kept pouches of wild yeast round their necks through the long grey marches, a portable miracle-worker to help them eke more sustenance out of their long-stashed dry stores; old hands of more than a season were known as sourdoughs. Although it’s been a long time, for most of us, since we had to rest so heavily on the staff of life, we still make bread do much of the symbolic work of food. Our daily bread, our bread and butter, the bread of heaven – its ubiquity was such that it could readily be used as a synecdoche for all sustenance, which is still how it is largely understood in much of the Islamic world. Wasting bread is a sin to many Muslims, and if a loaf is dropped you might see it retrieved, kissed and blessed, before being stashed in a nearby nook in case it should be needed; as is likely, given that quantities of bread are consumed at every meal, as they are also across the Mediterranean and most of Europe with the odd exception of Britain, which, as already noted, lacks what we might call a real baking tradition. It’s strange that the current generation of bakers, who really are doing something quite new in trying to raise the average quality of sustenance by such a degree, should so insistently define their work as old-fashioned or traditional. Like the Taoist acolytes who muddied the waters of history by ascribing all their insights to Lao Tzu, they hide real ability under the bushel of tradition; which is odd, when on the other side of the scale, you see countless food bloggers, writers and broadcasters continually talking about my this and their twist on that, constantly boasting originality – or perhaps it isn’t odd, but it is nevertheless a fact. If you consider what you do a craft, and if you look back into its long history as a craftsperson should, then everything you make will always be new and different, because it will always be imperfect; and it will always be the same, because it is all a part of the same process which started thousands of years ago. Each object, each meal or figure or painting or sentence, is only the local expression of that process, and as such is under constant threat of alteration, always a work in progress; that, anyway, is my view. I couldn’t tell you what bakers think. If you buy, forage or find a boxful of ripe plums, greengages, blackberries or cherries, their taut skins full to bursting of the warm south, then the first thing you should do is sit at an outside table and eat them, greedily and alone, with sticky chin and stained fingers, until you feel nearly ill; this is the appropriate response to abundance. The next thing you should do, though, is make jam. I’m not really a fan of half-cooked fruit, soggying cakes, hanging around with pancakes and meringues. The ripest of raw materials loses a lot of itself when just partially cooked (think of miserable grilled tomatoes), regaining its isness only through thorough boiling; the fact that you can keep the product long into the winter is a definite bonus, although it takes a certain amount of self-restraint. I always find raspberry and strawberry jams a little too frivolous. 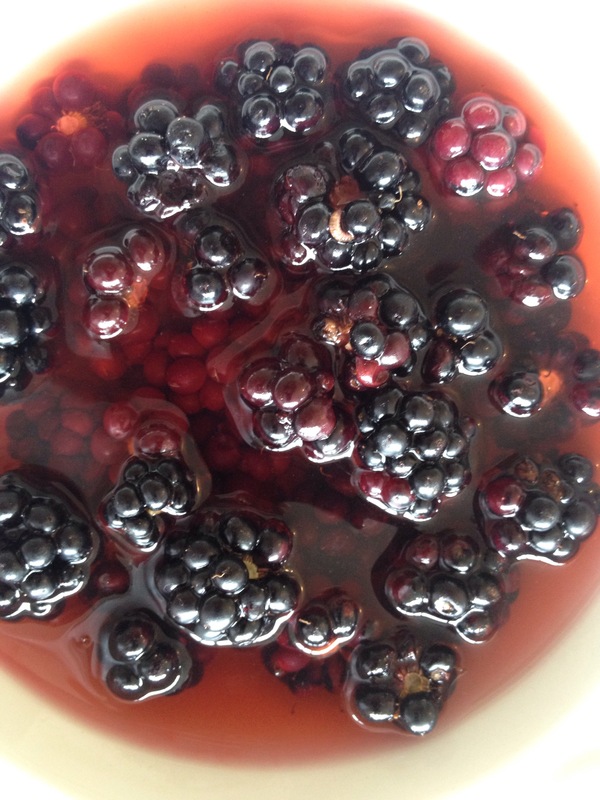 Blackberries, if you find them wild (and if you don’t, you have more money than sense), should more properly be made into a jelly, unless you like picking the woody pips out of your teeth all morning; a spreadable jelly, that is, not a wibble-wobble one – although that would also be an option. Clear, jewelled jellies are a fine thing, but take a little more investment of time and equipment than a simple jam, for which the best starting point is the fat, fleshy stone fruit of later summer and early autumn, with their complexities of sweet-sour juice and bitter almond, all of which can be played up, down or with in the cooking process. although I suppose recipe writers need to make a crust somehow. Where else would they spread their jam? If you are entering a WI competition or are very fussy about your set, you might need to follow particular recipes or at least guidelines for different kinds of fruit; if you stick to stone fruit, and add a couple of lemons to help the pectin along, though, you should be fine, although I suppose there are a few extra guidelines I normally follow. I stress prepared fruit, as the stones (especially if you are decadently making peach jam) add quite a bit to the weight. Don’t believe recipes that tell you to skim the stones off during cooking, either – it is a nightmare without end. Always cook the fruit to the consistency you want before adding the sugar, which seems to stiffen them; the slow cooking needed to bring them back to softness will caramelise the sugar, introducing a taste you don’t want – unless you do, in which case ignore this advice. A few well-chosen spices, added with the fruit, can really lift a jam. Don’t just reach for the vanilla pods; Vanilla Is Not A Universal Seasoning (a rule to live, or at least make dessert, by there), and in any case its heady sweetness isn’t really what you want in something so sugary. A star of anise adds a lovely boiled-sweet note to a simple plum jam, but in general I like to add ‘savoury’ spices – peppercorns, cloves, bay and cardamom all contribute a tiny bitterness to the mix. Put in a pinch of salt too, as you should with everything. Setting point, assuming you have cooked the fruit enough and your proportions were correct, is 108°C. It’s useful, if you have a probe thermometer, to use it alongside the plate test or that thing with the spoon, as one day the battery to your probe thermometer will run out or rust, and you will never buy another. I can never remember how to do that thing with the spoon, but the plate test is easy. Before you start cooking, put a plate in the fridge, then, when you think the jam might be ready, turn off the heat and put a spoonful onto the cold plate. Let it cool and poke it. If it jellifies, wrinkles, and otherwise looks like jam, it is ready; if not, cook for a bit longer and keep testing. Resist the urge to try the hot jam. I forgot to say you should be cooking in a really big pan – if you didn’t, it will probably have boiled over, ruining your hobs and possibly badly burning you, so make sure you do. The jam should be bottled while hot, a process which again requires a certain amount of care and attention. I suppose once you have poured boiling jam over your foot you will, for one reason or another, never do it again. Of course you should sterilise your jars in some fashion, but if you don’t, just keep the jam in the fridge – although this would be a shame, as jams, jellies and cordials should all really be stored where the winter light can stream through them, casting stained-glass shadows on the kitchen floor.